I wish I could say I was the original owner of these, but back when this line debuted I was only 8 years old and, needless to say (but I'm saying it anyway), I was physically & psychologically unable to keep a toy in it's package. No, instead, I acquired this figure (along with the rest of the line) through eBay only a few short years ago. I don't remember why exactly, but I ended up with two of these, so I gladly opened one up! One of my favorite aspects of DCCSH is the packaging. The front of the card features a standard background with a comic-based image of the figure including in the package adorning the left side of the card. Meaning Superman's package had an image of Superman, Hawkman's, a picture of Hawkman, et cetera. You don't see that too often with toy lines nowadays. 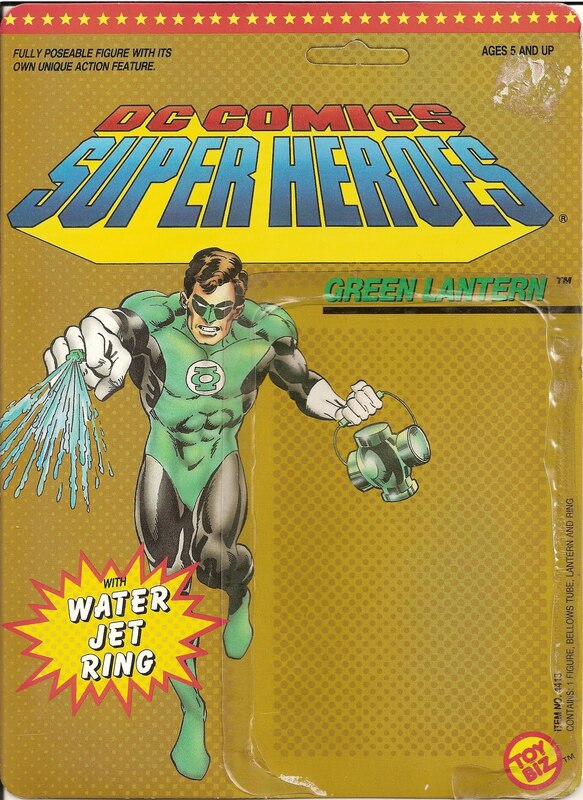 They only complaint I have with GL's image here is that he's shooting water out of his power ring. That's obviously a reference to the figure's action feature, but it kind of ruins the image itself. Why didn't they just color it green? 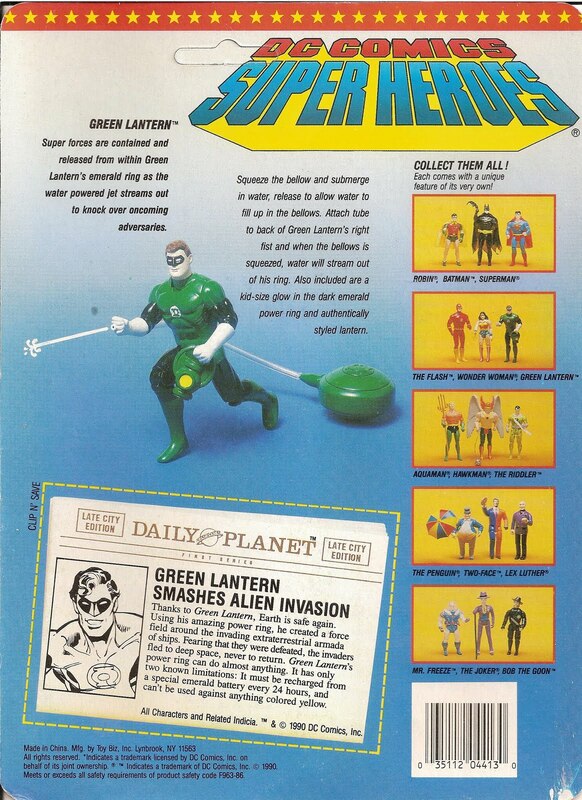 On the flipside of the card, we get a photograph of the actual figure along with some vague description of Green Lantern's power and instructions on how to use his action feature. You can also see nearly all the other figures in the line, including the three Batman figures that kicked things off. The lower half of the card has a mock newspaper clipping covering some random exploit of the featured character. As you can expect from a figure produced in the late '80s, most of the facial details are softly sculpted. And he's made out of hard plastic. I can't honestly say the figure bares a great resemblance to the source material. His head seems too narrow, yet features chubby cheeks and his nose is short. The mask is sculpted as opposed to just painted on like his costume. The only other sculpted edges on his uniform are the glove and boot lines. The ring isn't sculpted at all, instead it's created with a plastic pipe that runs through his forearm. Obviosly, the action feature was more important than little details like his GREEN LANTERN POWER RING. The paint on these figures was usually bad and would chip or scratch off if you weren't careful. That's especially true when it comes to the tampographed symbols and logos. Hal's GL symbol seems a bit spotty and I'm sure it wouldn't take much for it to get scratched out. Articulation is nothing spectacular by today's standards, but it was great for it's time. His head moves in something of a ball-jointed fashion, but not quite. I don't know exactly how it works, but I'm not welling to crack him open just to find out. He features swivels at the shoulders and hips, with hinged knees. That's a total of seven articulated points by my count. Not too bad. The accessory department is where GL has the advantage over his linemates. He features bellow with a hose that plugs into his right arm at the elbow. You would fill the bellow up with water then plug the hose into his arm and squeezing the bellow would shoot water out his "ring", effectively (not) recreating a... uhm,... power blast? I don't know what the real goal of having him shoot water is. Moving on! What Green Lantern figure would be complete without a handy-dandy, trusty, lantern-shaped, power battery? None! Take note, Mattel! Toy Biz threw in a smalle power battery for Hal to charge his non-power ring with. It fits into his left hand, although it's tough getting the handle into his hand. But the accessorizing fun doesn't stop there! Nope. Slim-fingered kids were treated to a plastic replica power ring they could wear to school, whilst getting wedgies from the class bully. This particular ring features a large bulb in the center of the GL symbol. I assume it's due to age, but the plastic transparent plastic is very cloudy. I wouldn't expect anyone already accustomed to current action figures to truly apprectiate DCCSH, but for me it's definitely a nostalgia thing, just like Kenner's The Real Ghostbusters or their later Batman stuff. There was a lot of fun to be had back then when you could let your imagination fly and dream up epic adventures. It's fun to look back on these toys and see how so many things have changed and how many things stay the same.